COLD SPRING HARBOR, N.Y., Dec. 5, 2018 /PRNewswire/ -- How is it that a sound can send a chill down your spine? 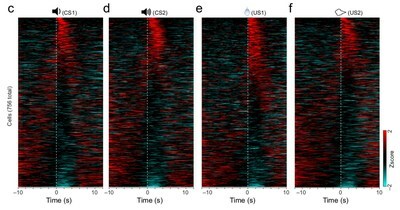 By observing individual brain cells of mice, scientists at Cold Spring Harbor Laboratory (CSHL) are understanding how a sound can incite fear. Investigator Bo Li focuses on a part of the mouse brain called the amygdala where sights, sounds, and other stimuli take on positive or negative associations through experience. The continuous process of learning and unlearning that occurs in the amygdala appears impaired in people with anxiety disorders or depression. Understanding brain cell, or neuron activity in the amygdala could result in better treatments. Li and Zhang used a microscope with a lens small enough to implant in the brain of a mouse, to track the firing activity of specific neurons before, during, and after an animal's training. They taught the animals to associate particular sounds with reward or punishment and saw the behavior of neurons evolve. The experiment associated one tone with an annoying puff of air—the punishment. The reward tone was a refreshing drop of water to drink. As the firing patterns became more specific, the animals licked in response to the reward-associated tone—anticipating water. They blinked in response to the punishment-associated sound—anticipating an air puff. Founded in 1890, Cold Spring Harbor Laboratory has shaped contemporary biomedical research and education with programs in cancer, neuroscience, plant biology and quantitative biology. Home to eight Nobel Prize winners, the private, not-for-profit Laboratory employs 1,100 people including 600 scientists, students and technicians. The Meetings & Courses Program annually hosts more than 12,000 scientists. The Laboratory's education arm also includes an academic publishing house, a graduate school and the DNA Learning Center with programs for middle and high school students and teachers. For more information, visit www.cshl.edu.